And if you are in gingerbread mood now… try this Malted Gingerbread Latte and make your own gingerbread spice mix! POUND CAKE: Preheat your oven to 350°F and grease a 9-by-5-inch loaf pan. In the bowl of an electric mixer fitted with the paddle attachment, beat the butter, sugar and vanilla on medium-low speed until light and fluffy, about 3-5 minutes, scraping down the sides as needed. Add eggs, one at a time, and keep beating for another 3 minutes. With mixer on low speed, add flour, baking powder, cocoa, salt and gingerbread spice. Be careful not to beat the batter at this point, only stir until well combined. Spoon batter into prepared pan and bake until cake is golden and cake tester inserted in the center comes out clean, about 50-55 minutes. Transfer to a wire rack to cool, 10 to 15 minutes. The cake needs to cool down completely, you may even let it sit over night. 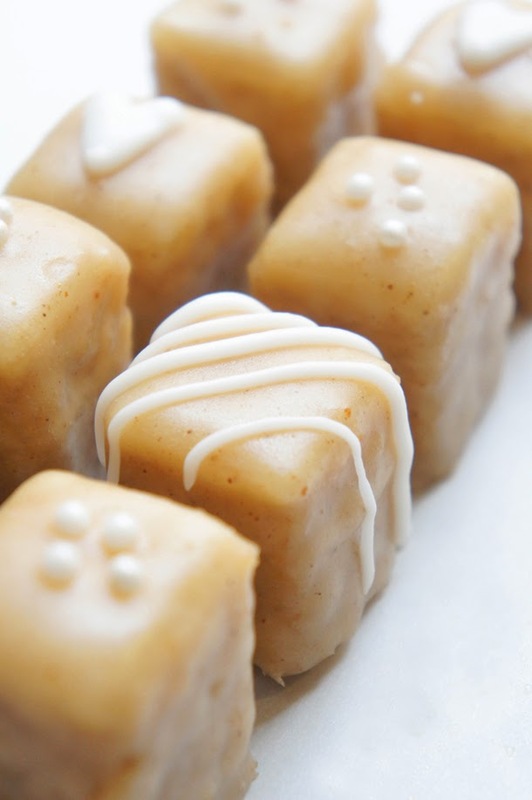 PETIT FOURS: Roll out the marzipan very thin. Slice the cake evenly in about ¼ inch thick slices. Spread the slices with apricot jam and make piles of 3 slices each, cover each stack with a layer of marzipan. Store the cake leftovers in a zip lock bag and use either to make cake pops or for snacking. FONDANT: Put the powdered sugar into a bowl and gradually add milk, whisking until mixture is consistency of heavy cream. Pour the fondant into a narrow bowl (6-7 inches wide) so you have enough room to dip the petits fours completely. To dip the petits fours, I recommend using 2 forks. Use the forks as extensions of your hands to dip the petits fours into the fondant, covering them completely. Set them on a cooling rack so the excess fondant can drip off. Let them dry for about 15 minutes, then dip them again. Let them cool down completely for at least 2 hours. 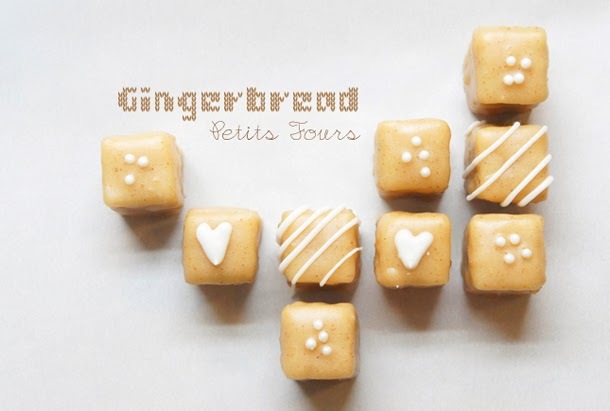 You can decorate the petits fours with sugar pearls (add while the fondant is still wet) or with royal icing. And enjoy! The instructions say add baking powder but the ingredients does not include how much? Tiffany, its one teaspoon. Thank you for pointing that out!